The Winter Coat is a wardrobe staple no matter where you live. If you reside in a warm climate-truest me you will need a heavier coat if it dips into the 50’s at night or you have the “pleasure” of traveling to a colder climate. All in all it’s always good to have a great winter coat at your fingertips. Please don’t resort to wearing your daughter’s ski parka or layering multiple sweaters, coats and scarves to keep you warm. There is nothing worse than seeing a gorgeous woman all dolled up for an evening out in the winter months and then topping off her gown with an overstuffed down ski vest! Your worst offense won’t be in the form of the fashion police but the many sorry stares coming your way. SO here my dear glamour girls are a few tips to make sure that yes in fact you have the perfect winter coat at the ready. •1. If you only have one winter coat make it a classic wool trench with flannel backed lining. Chic yet timeless. •2. The best length for any coat is at/or just above the knee. This length works with dresses, skirts, pants and leggings. •3. Fit is key. Check that the sleeves are long enough and that the coat doesn’t pull across the back. If it has a belt at the waist then it should hit at the waist (makes sense…right!) If it buttons or zips in front it should do so without any gaps. •4. Lining is important. The best winter coat lining comes with flannel backing for warmth. •5. Buy well …buy once! 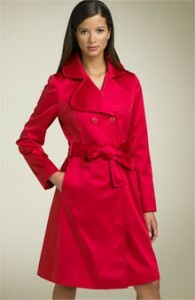 Only purchase a winter coat in a color and cut that you LOVE! P.S. When in doubt go for a single breasted coat instead of double breasted..it is by far the most flattering cut of all….and never ..ever..ever.. buy a coat that isn’t quit right just becasue it’s on sale..Save your cash for something you will want to wear for years to come. If however you do happen to find the perfect coat at 75 per cent off..BUY IT and know the fashion Gods are smiling down on you! Wardrobe Basic-The LBD/Little Black Dress! Blame it on Coco-the originator of the LBD-possibly the best invention in fashion… EVER!!! The “little black dress” is considered “THE” wardrobe essential. 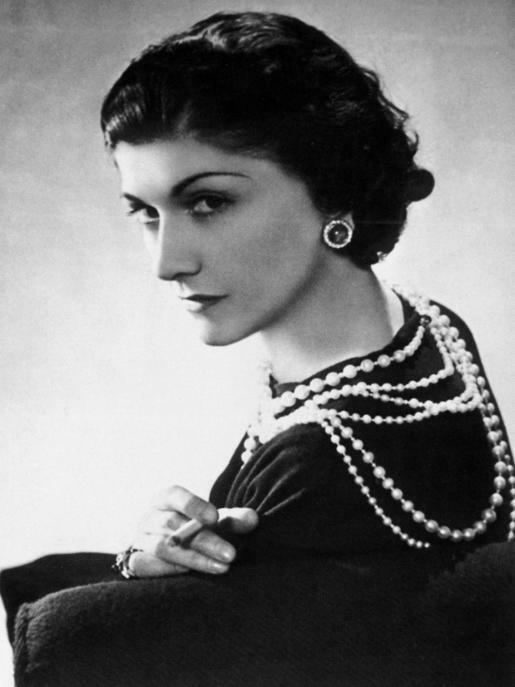 Coco Chanel originally designed the LBD in 1926 as a dress that was functional yet chic, wouldn’t show stains and would fit every woman. American Vogue referred to the LBD as the “Ford of Fashion”in reference to Henry Ford’s Model T. Needless to say this is one wardrobe item that has certainly stood the test of time. •1. Purchase the simplest of styles when it comes to the LBD. The less detail aka, ruffles, pleating, puckering etc. the better. KEEP IT SIMPLE! •2. Buy the best fabrication you can possibly afford. Crepe is great. So is lightweight wool. Cotton with a hint of spandex helps define shape but avoid any fabric that wrinkles. •3. Look for a perfect fit. Make sure it doesn’t pull at the bust, waist hip or underarm. If it does- go up a size and have it altered. 5. In choosing a simple black dress rest assured that you can dress it up or down with your choice of shoes, stockings, or accessories…the whole aim of the LBD- is to be versatile…yet chic. 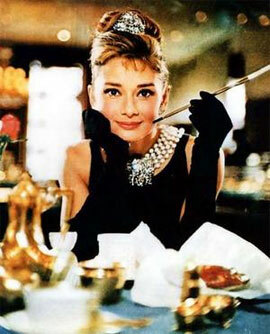 Audrey Hepburn in the most famous LBD of all time! Next to the pencil skirt the black pant is probably the best invention since ice cream. On second thought if your legs aren’t your best feature than in fact the pant would be number one as the most important piece of clothing in your wardrobe. My last black pant count stands at 12. I have flared, straight leg, cropped, zipper front, side zipper and back zippered in wool, cotton, crepe, corduroy, rayon…well you get the picture. The black pant is heaven because you can dress it up or down depending on your jacket, blouse, t-shirt, accessories, and shoe selection. How great is that? •2. Sit down in your pants before purchasing to make sure they are comfortable, (i.e.. don’t tug anywhere and don’t dip in the back.). •3. Buy the best quality of black pant you can afford. You will wear them a ton. Check the stitching so it’s even. If their lined, all the better. Make sure the zipper glides up and down and that the hem lays flat. •4. Buy a fabrication that doesn’t wrinkle. Abort any thought of buying black linen pants.. A Spandex blend of 5-10 percent is always a good thing in holding you in and making the pant shape smooth. •5. If you find a pant that fits perfectly in the hip and thigh but needs an adjustment at the waist or hem…there is something wonderful called a Tailor. A hem or waist alteration is very inexpensive and worth your money. The Basic of all Basics-The Black Pant! *The White Blouse-O.K….. So quit yawning. You must be thinking a white blouse- how utterly basic. That’s right! It is basic, and my darling girl you must have a great fitting white blouse no matter what your size or shape. Here are a few tips to make sure you plop down your money on one that lasts. •1. A white blouse should be 90-95 percent cotton with 5-10 percent spandex… Why? Because it will hold its shape better and not wrinkle. Promise. •2. Buy a white blouse that is fitted close to the body (that doesn’t mean tight) it means skimming your curves and has darts at the bust. Look for a princess seam. •3. Check the stitching on the blouse that they are even and there are no skipped needle marks. •4. Even if it says Dry Clean only-Don’t! Dry cleaning solvent yellows a white blouse. Instead- hand wash in cold water. Line Dry. •5. Buy the best white blouse that you can possibly afford. •6. 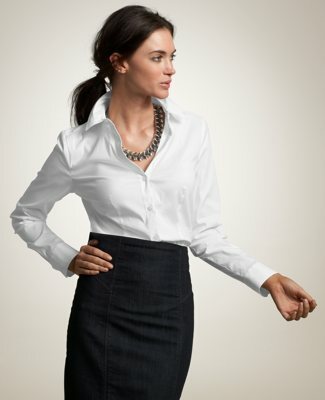 Make sure your white blouse is long enough to tuck into your shirt or pants. •7. If you find a white blouse that fits like a dream -buy two. You will so thank me in the morning. *In an effort to help every working woman attain a complete wardrobe I will be running a new weekly feature giving you wardrobe basics that every working woman should have in her closet. Now just in case you’re wondering about the term working woman-All women are working women. It doesn’t matter if you have an office, a home office or you work at home with your children. If you are born a woman ..ergo..you work..GO forth and be fabulous….. Here we go! It’s almost the end of July and even though the temp today in SUNNY California is 101 degrees, I am finally ready (and I hope you are)- to talk Fall Fashion 2009-2010. Rule #1: Make sure your pencil skirt fits! Meaning: It should sit comfortably around the waist and glide past your hip to reach knee or just above knee length. Translation:- no pulling, gaping, bunching of fabric at the hip, derriere(bum/booty) whatever you want to call it … or any other area heading down to the knee. If you need a larger size that will alleviate the gaposis problem then purchase skirt to fit your widest area and have the waist altered to fit you. There is this amazing resource called a TAILOR. A good tailor doesn’t cost a fortune and can alter the waist and length in no time flat. Rule #2: Optimal skirt length on every woman is just above or at the knee. If it’s to long…..-H.E.M. it. A good pencil skirt will last a lifetime. 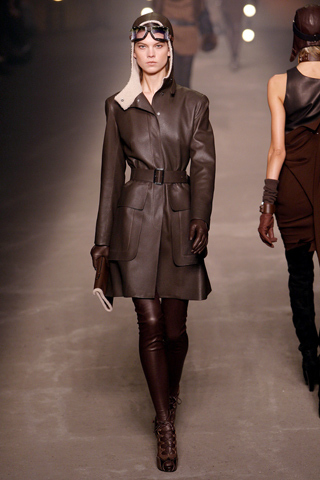 Jason Wu’s Fall 2009 Pencil Skirt. Do you think Michelle Obama has this little frock on order? Time will tell. Spring is finally here!!!! I know, I know, the calendar says that Spring “officially” started March 20, but tell that to anyone living east of the Rookies, where snow fell until April 4 of this year and they will beg to differ! It seems that the onset of Spring coincides with Easter/Passover or whichever one falls first-I think it personally has something to do with the whole Easter bonnet thing which P.S. no one seems to be wearing-as I see pastel brim hats marked at 75% off in the department store-but I digress. So back to the onset of spring-fashionably speaking! By this time women in the colder climates have “so had it” with 19 layers of clothing to keep them warm and want a little something to actually show off their figures and make them feel bright even on a rainy day. Low and behold designers have taken the classic trench and turned this standard staple apparel item into a fashion statement Thank you fashion Gods!